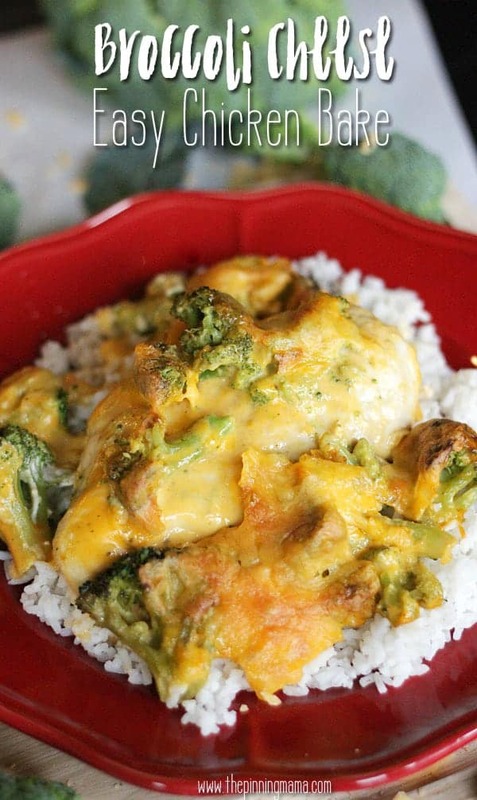 With just 4 ingredients, this broccoli cheese chicken bake recipe brings all the delicious flavor of comfort food into a dinner that is almost too easy to make on a busy weeknight! If you can’t tell by all of my previous easy chicken bake recipes, this meal has become the go to dinner for busy week nights in our home. They are great because you can throw them together in minutes, they are a super hearty dinner filled with wholesome white meat chicken and packed with veggies, and they bring together some of our favorite flavor combos in a super easy package. One of the popular questions I get about my blog is where I get my recipes. I find inspiration all over, but the real answer is that I mostly make them up by taking flavors my family loves, and foods my kids will eat and package it together in a recipe that is easy enough for me to make when I am short on time and have three kids begging for attention. The chicken bake recipes are a pretty simple formula: chicken + themed seasonings + veggies + cheese = delicious balanced meal in minutes. Since I know my family loves it and all my kids will eat it, I look for new flavors or seasonings that we love and adapt them to fit my formula. 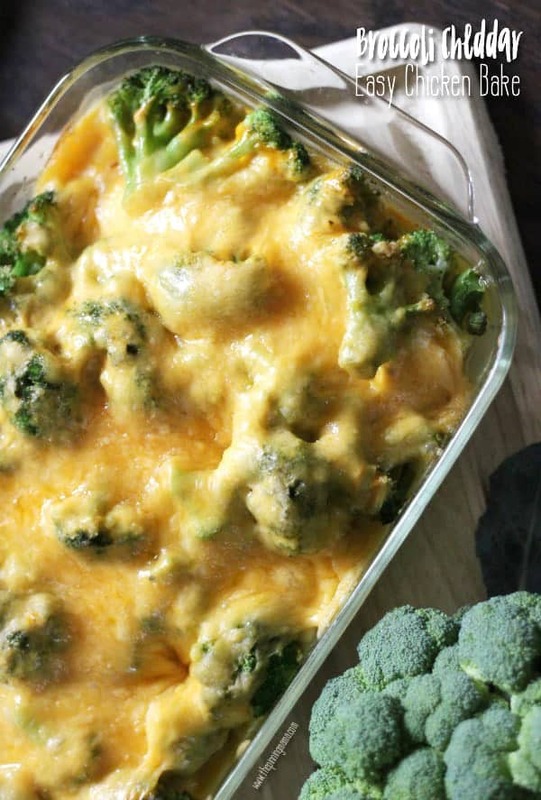 One flavor combo that has been on my to make list for quite some time is broccoli cheese. I knew this would be a big hit because it is super kid friendly and one of my husband’s favorites. I was a little stuck though because making a cheese sauce would make the recipe a little too time intensive for a busy weeknight, so the idea has just been sitting at the back of my mind waiting for an epiphany. Then I saw this Campbell’s Oven Sauce in Cheesy Broccoli and BOOM! It was done! This was the missing piece of the puzzle for the dish I had been wanting to create and gave me just the help I needed to be able to make it super simple for a busy weeknight. Campbell’s new products comes in varieties for Slow Cooker, Skillet, Oven and Grill Sauces and all sorts of flavors, which can make dinner a breeze whatever way you want to cook or are craving to eat. You can find more delicious Campbell recipes here. When I promise quick, this dish won’t disappoint. It will be prepped and to the oven in about 10 minutes, or maybe even less! UPDATE: I have questions for those that can’t find the sauce about a substitute. I tried this recipe this past weekend using 2 cans of Condensed Campbell’s Broccoli Cheese Soup and it turned out great! Just replace the oven sauce in the recipe with the condensed broccoli cheese soup (do not dilute) and you should be in business! Grab your baking dish. I use a 2 qt pyrex because it fits 3 chicken breasts perfectly. Place your chicken breasts flat on the bottom of the dish. 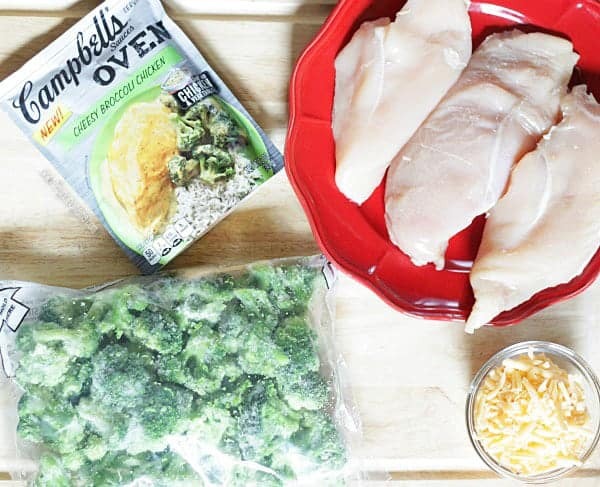 Put the frozen broccoli florets on top of the chicken and then spread the Campbell’s Cheesy Broccoli Sauce over the top of the broccoli evenly. Sprinkle the cheddar cheese on top of the dish and it is ready to go in the oven. Bake at 400F for 45-60 minutes, or until the chicken is cooked through, and you have a hot, fresh family meal ready to go! As promised… couldn’t be easier and you will be head over heels for the creamy, cheesy goodness. Note: I cook mine on the lower middle rack and have not needed to cover it, however each oven varies in size and true temperature, so keep an eye on it and if it gets to where you don’t want it to continue to brown, loosely cover with a piece of foil for the remainder of the cook time. I have talked a lot about how easy this dish is, but let’s break from that for a minute and talk about how crazy delicious it is. The Campbell’s cheddar sauce was perfection. It is thick enough to make the dish come together perfectly and the sharp cheddar flavor is just the cheesy goodness my family loves. My kids devoured the nutrient rich broccoli when it is coated in the amazingly tasty cheese sauce without a second thought. That my friends is a win. We served this on top of rice, but if you wanted to go lighter it would also be delicious on a bed of sautéed spinach. You can even use the leftovers chopped up and put with some romaine into a wrap. YUM! It is a pretty versatile meal and perfect to be reinvented into some new dishes for even easier lunches or dinners to serve throughout the week. Check out more delicious Campbell recipes or more of my Easy Chicken Bake Recipes for more quick and easy dinner ideas! Lay the chicken breasts flat on the bottom of a baking dish. Cover the chicken breasts with the frozen broccoli florets. Spread the package of the Campbell's Oven Sauce evenly over the top of the broccoli. Sprinkle the cheddar cheese over the top of the sauce. Place on the middle rack in an oven preheated to 400F for 45-60 minutes or until the chicken is cooked through. Depending on your oven, altitude and thickness of the chicken breasts this could be more or less time. Check the chicken throughout to make sure that the top is not too brown, if you don't want it to get any more browned, then place a piece of foil loosely over the top for the remainder of the cooking time. Serve over rice, pasta, or greens and enjoy! My family and I LOVE all of your chicken bake recipes and I am so excited to try this one! 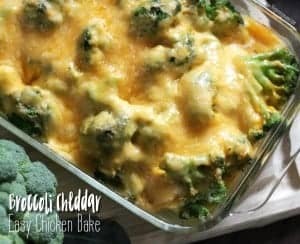 These bakes have become my go to on busy weeknights and I love the flavors of broccoli and cheese! Can you sub fresh broccoli? Bought the oven cheesy b err broccoli chicken pkg. On spur of the moment. Delighted to fix this recipe for supper tonight. What if we can’t find the Campbell’s product. Can u used cheesy broccoli soup? I think it would be a good substitute if you can find a nice thick one, or maybe a concentrated variety. Let me know how it turns out! do you just add the dry campbells product or make the sauce then add it? I made the sauce then added it and my chicken is not even close to being done. its been in there for 75 min and I even turned up the heat in the last 10 min. what did I do wrong.? The product I used (shown in the photos) is not a dry mix. It is a premade sauce and I didn’t do anything except pour it out of the package and spread it over the chicken. Since the final dish is really deep and the broccoli is frozen it will take longer than cooking regular chicken breast, and I would say 45min-an hour is pretty normal. If your chicken is taking longer than that there are a few things you could try. 1. Get an oven thermometer to make sure it is getting as hot as you set it to. 2. Sometimes chicken breasts can be really, really thick. In this case it helps to butterfly your chicken breast so they are thinner and will cook faster. 3. Use a bigger pan so everything can spread out a bit more. If it is packed in tight it will take longer to cook. I hope these help and you enjoy the meal! is the chicken frozen or thawed out.? do you spray the pan with pam? This should be thawed chicken. It would probably take 2 hours to cook if you used frozen, so make sure to thaw it. I don’t think it is necessary to spray the pan but it won’t hurt anything if you do! Happy eating! I cant find the package in Canada we dont carry it.. did you end up using the soup? how did it turn out? Where did you buy the Campbell’s cheese sauce? I looked in my local Target and Walmart last night. Going to try Publix now. I have everything but that and planned to make it tonight. Hi Natalie- I hope you got it in time! I live on the west coast so it may be different but they carry them at both Albertsons and Kroger here. They have a store finder on their website too if it is helpful http://www.campbellsauces.com (Look at the bottom) If you can’t find it you can always try a thicker broccoli cheese soup! Hope you love the recipe! Hi Natalie, did you end up finding the sauce? I found it in the soup aisle at Winn-Dixie, on the opposite side of the canned soup. There are displays with different types of sauces there. Do I cook this coved or uncovered? I have a very good recipe for this dish already but when I saw how easy this one was I thought how great! However, the Campbell’s sauce is so salty that it ruined the whole dish. And putting cheese overtop was too much and added to the saltiness. Unfortunately, I won’t make this again and will stick to my recipe. Sorry! I made this tonight but made a couple changes. First I cut my chicken breast into strips and laid them in the bottom. I then cooked a sweet onion in butter put it on top of the uncooked chicken. Next I added fresh broccoli then added a can of cheddar soup and cream of chicken soup. I sprinkled the top with cheddar and Monterey cheese. Cooked for 40 minutes and spooned over white rice. It was to die for. Tomorrow we will be having the leftovers over penne pasta. I made this dish this evening for dinner, couldn’t find the Campbell’s sauce so I took the advice from another post I saw about this dish. In place of the sauce I used a can of cream of chicken soup and mixed 1/2 can of water with it. I also added some vidalia onions on the chicken before the broccoli. My husbands exact words were ” this is freaking awesome!” This is one we will definitely fix again! How many calories, fat, and carbs is there in one serving? What is the serving size? Will be making this, but only use organic products. So I will use Pacific cream of chicken soup will let you know how it turns out. Hi. I love this dish! My mum first cooked it up but with a twist. It’s so moreish and you’ll wish you had cooked more. 🙂 before starting, steam the broccoli and then drain it thoroughly as broccoli holds lots of water. Once done, lay your chicken breasts in your cooking dish. use cream of mushroom soup (Campbell’s is best) but before you pour it, add some madras curry paste or korma for a slightly mild taste, to the soup. Pour it over the chicken and broccoli, let it settle and then cover with cheese. Voila! This is the next level for this already amazing dish! Hope you enjoy. would a can of cream of chicken work also? I was wondering how many calories are in this meal including rice? Can the leftover be frozen? Made this tonight & it is super delicious! I did my own variation of this recipe. I used 1 can of broccoli cheese soup; 1 jar of Ragu Double Cheddar Cheese Creations; 2 packets of dried Ranch salad dressing seasoning; 4-6 boneless, skinless chicken breast & 4-5 cubed russet potatoes. (I precooked potatoes in microwave for 6-7 minutes. Then cut them into cubes.) I pounded chicken breast to thin them out & then lined them on bottom of glass 9×12 baking dish. I layered about 4 cups of frozen broccoli florets & the cubed potatoes on top of the chicken. I mixed up soup, ranch seasoning packets & Ragu cheese sauce in a bowl & spooned it evenly over the chicken, frozen broccoli florets& potatoes. Poured about 2 cups of cheddar jack on the very top. Baked at 400 degrees F for 55-60 minutes. Turned out great! I tried using one can cream of broccoli and mixing it with two cans of Campbells cheedar cheese as a substitute! And instead of rice I put frozen steak fries on top of the cheese then, cooked covered with foil for the first 15 minutes, then uncovered for 30. Came out terrific and my kids went crazy!! Do they have a cheese soup or a cheddar soup? That would be a closer match! If I add breadcrumbs, when should I put them on, and do I put them on or under the cheese? I would put it in the oven, let it start to cook and the cheese melt, then add them the last 20-30 minutes on top. This will give it a nice toasty coating on top! This was delicious but I wasn’t too sure how it would come out and taste. I have been looking everywhere for a recipe like this and I’m glad I found this one. One thing that I couldn’t find was the campbells sauce but I saw that I could use something else but I still couldn’t find cheesy broccoli soup, so I used cream of broccoli and it turned out great still. Next time, I would like to try the sauce that was listed. Other than that, thank you for the recipe. I made with fresh broccoli and a can of cream of mushroom instead of the broccoli cheddar sauce and it came out amaaaazing! I served over some brown rice. Sooooo good! I used the Campbell’s Parmesan Chicken Sauce since they didn’t have Broccoli Cheese. Definitely will become a regular at our house.